An ideal first project. Large needles and three strands held together produce almost instant results and there are only two small seams to sew. 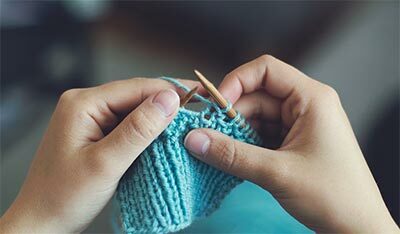 You'll need to know how to: cast on, knit (k), purl (p), increase by knitting twice into the same stitch, knit two stitches together (k2tog), bind off, and sew a seam using yarn. To fit Small (30-32 chest), Medium (34-36 chest), Large (38-40 chest). Directions are for smallest size with larger sizes in parentheses. If there is only one figure, it applies to all sizes. 9 stitches and 12 rows to 4"/10cm using size US 15 (10 mm) needles and 3 strands of yarn held together. TO INSURE PROPER SIZE, TAKE TIME TO CHECK GAUGE. Hold one strand each of A, B and C together throughout. Stockinette Stitch: Knit on right side (RS) rows; Purl on wrong side (WS) rows. With size US 15 (10 mm) needles and one strand each of A, B and C held together, cast on 20 (22, 22) sts. Row 1 (WS): Purl. Row 2: Knit. Row 3: Purl. Row 4: Knit twice into 1st st, knit to last st, knit twice into last st22 (24, 24) sts. Repeat these last 4 rows until a total of 13 (13, 14) increase rows have been made46 (48, 50) sts. Work even in Stockinette stitch until piece measures 20/51cm (Row 60). Tie contrast yarn markers (or pin safety pins) on first and last stitch of this row to mark top of sleeve. Work even in Stockinette stitch until piece measures 19 (21, 23)/48 (50.5, 53)cm from markers, end with WS row. Tie additional yarn markers (or pin safety pins) on first and last stitch of this row (to mark top of second sleeve). Work 8 (8, 4) rows even, end with a WS row. Row 1 (decrease row): K2tog, knit to last 2 stitches, k2tog. Row 2 (WS): Purl. Row 3: Knit. Row 4: Purl. Repeat last 4 rows until a total of 13 (13, 14) decrease rows have been made20 (22, 22) sts. Be sure to end with row 4 (60 rows should have been worked from top of sleeve). Next (RS) row: Bind off loosely. Lay piece flat, pinning to measurements, and lightly steam with iron. 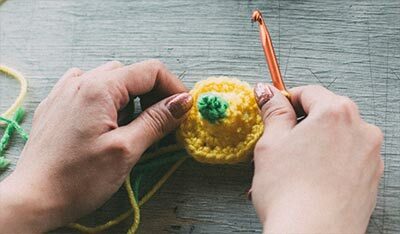 Using 1 strand of B (medium color yarn) threaded double through tapestry or yarn needle, sew sleeve seams from cuff to markers. Remove markers. Darn in any yarn ends.